I found this recipe at allears.net where they have a lot of WDW park recipes saved. 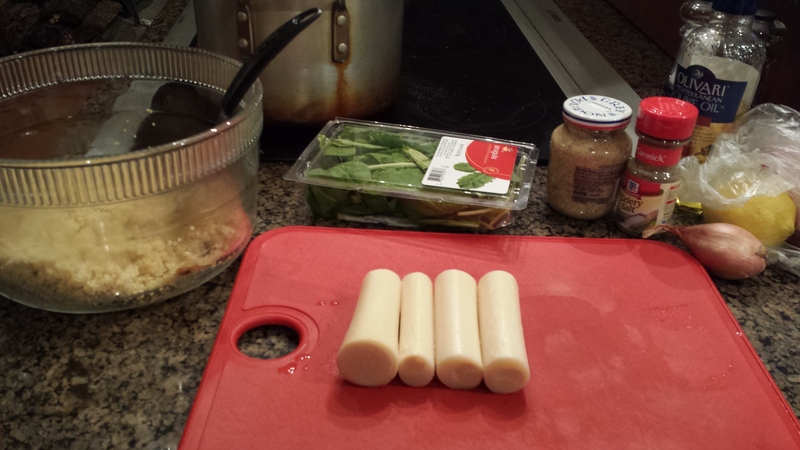 I like to have pictures when I try a new recipe, so this is my attempt at food blogging while still keeping it Disney. I made some changes to the recipe, like not adding shrimp (some people at home are allergic) and preparing the quinoa differently. For the original recipe, click here. This dish can be found at Crystal Palace at the Magic Kingdom. First, I cooked the quinoa. I used 1 cup of uncooked quinoa and 2 cups of water and mixed them in my rice cooker. You could also use a deep pot if you don’t have a rice cooker. Once the quinoa was done, I removed it from the bowl and put it in a glass bowl, then put it in the fridge to cool. 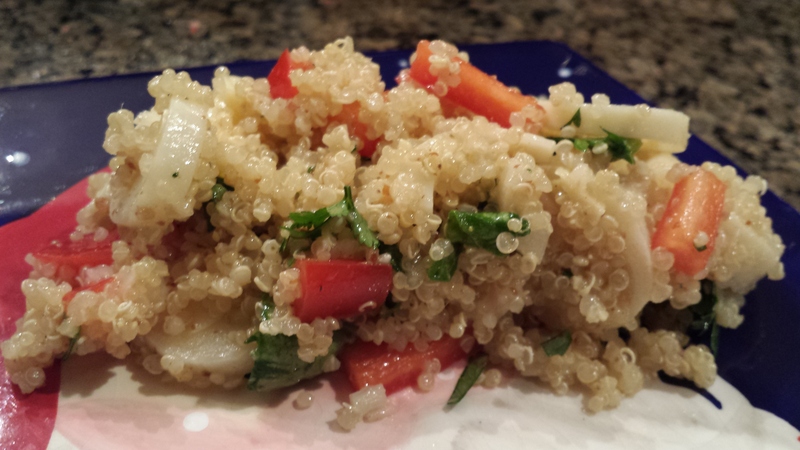 While the quinoa was cooking, I chopped up all the ingredients that would be added to the salad: hearts of palm, baby arugula, red peppers, and cilantro. As I mentioned I did omit the shrimp. The recipe calls for a red pepper, but next time I might add a yellow pepper to it as well for more crunch. Then I mixed the ingredients for the mustard dressing. I like to do this separately so that I can adjust the seasonings before adding it to the salad. I did not add the olive oil at this time because I didn’t know how much dressing would be soaked in, and I wanted to avoid an oily salad. After I whisked the dressing, I took the quinoa out of the fridge and added the chopped up vegetables. I then mixed the dressing into the quinoa salad and tasted it for seasonings. This is also when I added the olive oil, just enough (about 2 tablespoons) so that the quinoa didn’t stick or clump. And voila! The salad was a huge success. It would be a wonderful new dish to try at a cookout AND it’s really pretty healthy. The dressing is bright and fresh. It’s also quite a looker! *The original recipe called for 3 ounces of olive oil blend, and I’m not sure what that is. Cook the quinoa in a large quantity of salted boiling water (4 times the volume of the quinoa) for about 20 minutes. This washes out the slight natural bitterness of the grain. 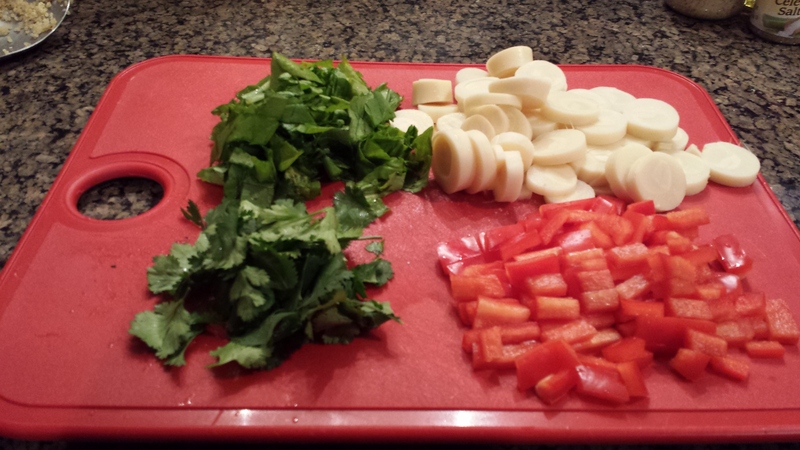 Cut the hearts of palm into ¾ inch coins or half coins depending on size. Blend together all the ingredients for the mustard dressing. Assemble everything together in a mixing bowl.